One of the bedrock principles upon which our nation was built is our freedom to speak freely. Our ability to have intelligent discourse, especially when there's disagreement, will determine whether our nation stagnates or continues to grow. When we allow one side of a conversation to silence another, the resulting monopolization of ideas puts us on a dangerous path toward tyranny. America is more polarized than ever. That's not to say that opposing sides are necessarily further apart. Rather, the polarization seems starker because any effort to bridge the chasm is disparaged. The extremes at each side of a debate become so inflexible that no divergence or alternative is tolerated. When we disagree with another, the response should not be to silence them by shouting louder or threatening the source of their livelihood. If we believe that we speak words of truth, let those words be enough. Two days ago, Phil Robertson was summarily suspended by A&E Network from his role in Duck Dynasty over comments he'd made in an interview. Whether and how much we agree or disagree with what he said, should he be suspended or fired over his comments? Should the fact that a significant number of people were deeply hurt and offended by his remarks justify his suspension? The Freedom of Speech I espouse is beyond the protection guaranteed in our Constitution. I understand that no laws have been made by Congress to impede his right to expression. However, the principle behind that freedom that's been eroded -- the ability to have civil discourse without coercion. Both sides of the political spectrum have been guilty of the same underlying tactics. Sadly, many of these tactics succeed -- at least in loose definition of the word "success." A position wins, not due to agreement or even compromise, by submission. At home, we try to teach our children how to have a proper discourse. WSpehen we communicate our rules (or consequences), they are allowed to question for the purposes of understanding. After understanding, they are allowed to express their opinions and try to change our positions. However, they must always conduct themselves respectfully in word, tone, and conduct. We don't always succeed but we consciously try. Peggy and I take seriously our duty to teach them certain truths; our desire is for them to do more than just follow the truth but to fully accept it. Those who know me know where I stand on key issues. More importantly, you know (I hope!!!) where I turn to for guidance on my positions. Though I hold my convictions to be truth, I realize others won't be convinced simply by my speaking louder or silencing them. As Christians give and serve during this and all seasons, let us remember for Whom and by Whom we serve. When we distribute food and toys, these aren't just acts of charity. Let us not settle for fleeting joy. Rather, what we share ought to be His everlasting grace. During this season of giving, better yet, even after this season of giving, let our charity be extensions of His grace. Let all good that we do be an extension of His love and point to His lovingkindness. My wife and I have read and enjoyed Dee Henderson's O'Malley series. Though many have tried, few successfully blend faith, action and romance as Ms. Henderson has. Against this backdrop, I eagerly anticipated this new novel. SPOILER ALERT: I have yet to figure out how to review a book of fiction without giving away at least some part of the story line. For that, I confess my shortcoming and apologize in advance. The description on the back cover states, "Charlotte Graham is at the center of the most kidnapping in Chicago history." So, though I approached this book with anticipation based on past joy with Ms. Henderson, my joy wasn't unfair. This line led me to believe there would be more action and suspense. Unfortunately, the kidnapping had occurred years prior so the events are described reflectively, lacking the anticipation and energy I'd come to expect from Ms. Henderson's books. Overall, the pace lacked briskness. What I did enjoy about the book was the burden of a large inheritance. If your desire is to dispose of a large inheritance in a responsible manner, what would you do? What criteria would you use to choose meritful organizations or projects? Would you drop a few large sums of money or distribute the money among many organizations? Though few of us will have such a "challenge" in our lifetimes, I appreciated the opportunity to consider the dilemma and apply it to my own, lesser situation. Am I being a good steward with my riches? Charlotte Graham, the victim of the kidnapping, is at the center of this book. All other characters' roles and purposes relate to Charlotte. Bryce Bishop was brought into her life for a business exchange but their relationship grew in scope and complexity. Because of the pains from Charlotte's life, their relationship grows slowly and never quite reaches vitality. Though truthful to the storyline, the lack of passion in their relationship can be disappointing for readers. The more interesting relationship, to me, was between Charlotte and John Key, her bodyguard, who became head of security for her enterprise. John's past and skills are not fully developed, which left me yearning for a view behind his mystique. Perhaps that will be saved for a sequel. 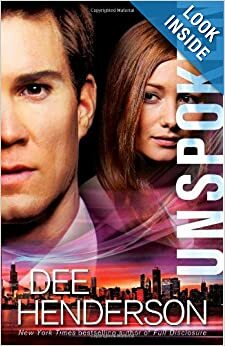 Overall, I don't some readers will enjoy Unspoken. For me, whether because of undue expectations or otherwise, I found the book lacking. However, I will continue to be a fan of Ms. Henderson and look forward to her next work. NOTE: I received a free copy of this book from Bethany House for the purposes of this review. 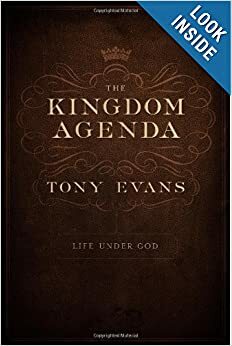 With these words, Dr. Tony Evans seeks to bring all of God's chosen subjects under His lordship. When we bow down before the King of Kings, we must be aware if we hold back parts of our lives from Him. Let us not be mistaken that we either submit to Him fully or we fail to fully accept His Lordship. This should be a welcome reminder for all followers of Christ as we, all too often, compartmentalize our life into family, work, and church. That is to say, we withhold 2/3 of our lives from His Lordship. This book is an excellent resource for those who need that extra nudge to live a life of discipleship. With a perfect blend of Scriptural truth and anecdotes and stories, Dr. Evans presents difficult material in a way that is both convincing and understandable. Further, each chapter includes enough depth and detail so it will occupy a prominent place on my shelf for continued reference. Please consider helping Muia and his family.